The MOLOTOV are a Punk/Rap/Rock outfit who create a diverse and original fusion of sounds. They mix machine-gun rap/punk lines and melodic female vocals with infectious guitar/bass/keyboard rhythms and driving beats and their original lyrics are a challenging blend of the social, personal & political. Their explosive and energetic live performances also include distinctive cover versions of Prodigy’s “BREATHE”, The Angels “Take a Long Line” & RATM’s “Guerilla Radio”, reflecting a broad range of musical influences. 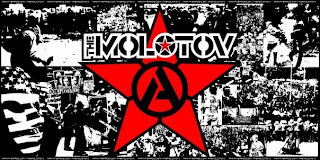 The MOLOTOV’s latest demo “Last Rites 4 Capitalism” has been described as “a hard-hitting and refreshing hybrid of styles”.